When chefs get tired of cooking the same old thing, there’s two options: Create new dishes or cook something entirely different. Recently, there’s been an uptick in specialty nights at notable restaurants throughout the city, including a classic Sunday roast-chicken dinner at Flora Bar on the Upper East Side; a weekly meal at Sunday in Brooklyn, dedicated to old-school Italian fare; and a Japanese curry night at Williamsburg favorite Marlow & Sons, an ode to chef Patch Troffer’s Japanese heritage and a new direction for the restaurant’s menu. “I like the process of just making the curry or any long process food that’s really warming and soulful,” Troffer says. “People are really open and excited about it, and for some of them, it’s their first time trying this food.” Here are all the specialty nights worth checking out at New York City restaurants right now. 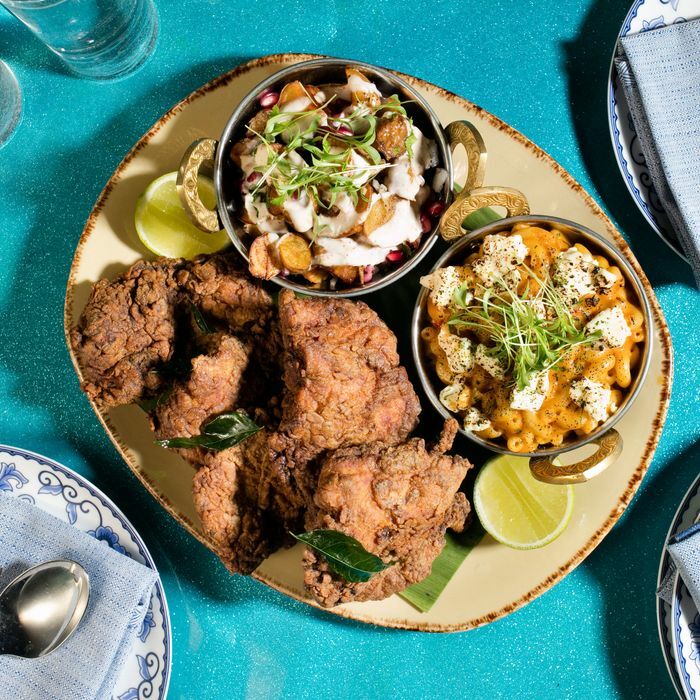 In Soho, chef Floyd Cardoz has turned fried chicken on its head with a Sunday and Monday dinner special inspired by street food in the South — South India, to be specific. For his significantly more flavorful take, Cardoz marinates chicken thighs overnight in a mixture of lime juice, coconut oil, curry leaves, cumin, coriander, garlic, and ginger before dusting it with rice flour and deep frying the chicken in canola oil. The result is fried chicken that is not only crunchy, but actually tastes good under all that crackly skin. It’s meant to be shared, so bring a friend along to dig in. 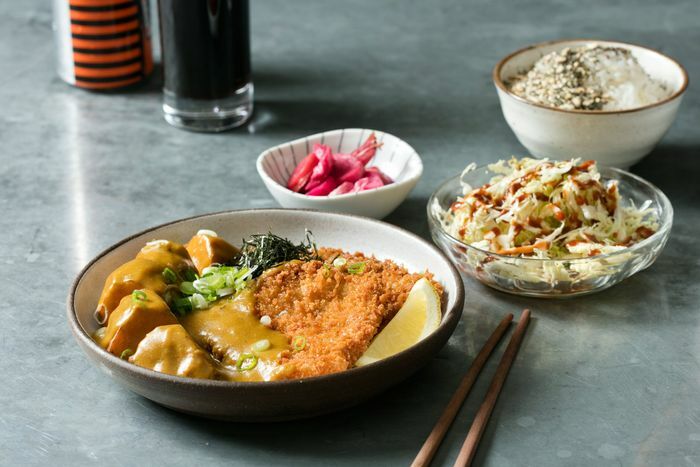 The folks at butcher-grocer Meat Hook have friends in all the right places, and that shows when it comes to their many dinner series including the recently launched Noodle Night, a weekly Monday night dinner series at Threes Brewing in Gowanus. If you haven’t had the pleasure of checking it out, there’s still two to go: an unmissable collaboration with Vietnamese hot spot Di An Di on March 18 and a final night with Hanoi Soup Shop, a spinoff of the very popular Hanoi House. Each Noodle Night kicks off at 5 p.m., so come early and come hungry. What better way to spend a Sunday night than digging into a family-style meal at a museum? Flora Bar recently launched a weekly special centered around a whole or half roasted chicken. To accompany said chicken, the staff serves deviled eggs, potato gratin, roasted squash, chicory salad, and extremely old-school, but always good Parker house rolls. If you’re not fortunate enough to have a nonna, Sunday in Brooklyn has launched a dinner series that’ll make you feel like you do. 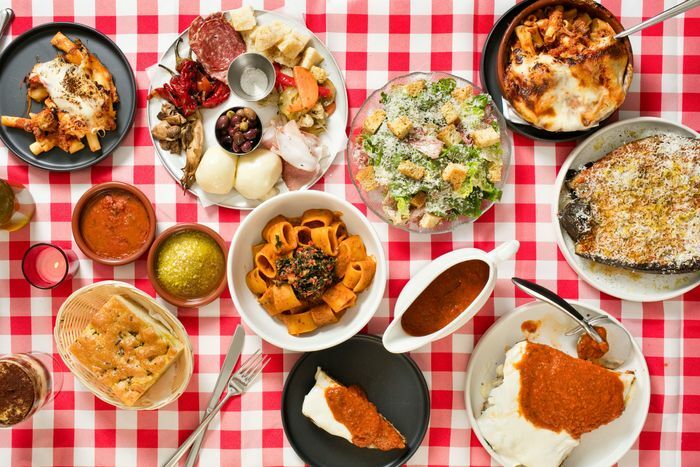 The Williamsburg restaurant’s Red Sauce Sunday is an ode to old-school Italian dinners and features all the classics, like baked ziti, penne alla vodka, chicken parm, eggplant puttanesca, Caesar salad, gabagool, fresh focaccia and more. Everything’s available à la carte, but you’d be doing yourself a disservice if you didn’t grab a friend and go all in on the prix-fixe option featuring all of the above. This pop-up bar series is a vehicle for comedian and bartender Griffin Hennelly, who’s created cocktails that come with jokes included (like the Personal Insult, where he roasts you while he makes the drink). But there’s also a down-home food element: Along with the drinks, Root & Bone is serving a special late-night menu of pimento grilled bacon, egg, and cheese; fried wings; and fried green tomatoes, or basically a comedy show with food. It kicks off at 10 p.m. every Friday and Saturday night. What sets this Brooklyn restaurant’s Sunday dinner apart from all the others is that it’s constantly changing, so while you could be enjoying kung pao chicken, coconut tapioca pudding, and white wine one week, next week’s dinner might be all about seafood stew and cinnamon-sugar cream puffs. The theme is announced every week via the Fancy Nancy Instagram page, or there’s the always exciting prospect of living dangerously and just showing up for whatever’s in store. New York isn’t exactly hurting when it comes to Italian restaurants, but few Italian restaurants come with a retail arm and a reputation for revitalizing Milan, Italy. So, color us interested in this very new series at Italian import 10 Corso Como, where Momofuku alum Jordan Frosolone serves a three-course Italian dinner every Sunday. Among the options are beef meatballs with mozzarella and basil, bacon-wrapped scallions, tuna carpaccio, seven kinds of pasta (the Underground Gourmet highly recommend the cacio e pepe), and tiramisu for dessert. This weekly dinner has been around for a little under a year, but still can’t be beat. Every Monday, this Korean barbecue spot celebrates all things KFC, or Korean fried chicken, with Chimek Monday. It’s pretty straightforward: Get a half chicken and a pitcher of beer or a whole chicken and a pitcher of beer. Diners get to choose how their chicken is dressed (options include sweet soy garlic, Carolina mustard barbecue, honey tamarind, and more) and the rest is pretty self-explanatory. In keeping with their tradition of elevating bar food, the NoMad Bar has a new Sunday Roast dinner featuring highbrow takes on pub classics. The three-course prix-fixe dinner starts with a caramelized onion tarte and potted trout dip. For the main course there’s slow-cooked leg of lamb with Yorkshire pudding. And dessert is banoffee pie, a cross between bananas and toffee with some cream thrown in for good measure. Should you truly want to live like the Queen of England, diners can add black truffles and foie gras for a little extra.